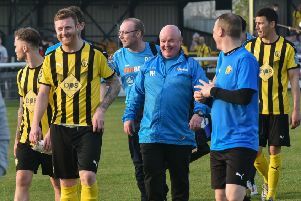 Brakes boss Paul Holleran has credited their tame home defeat to Hitchin as the catalyst for their three-match winning streak. Leamington failed to get a shot on target against their play-off rivals, slumping to 12th in the table as a result. However, they followed it up with wins at Hungerford and Slough before overcoming Dunstable Town on Tuesday night to move back to the fringes of the play-offs. And Holleran said a freshening up of both personnel and formation was behind their revival. “We had a little look after the Hitchin game and it was clear what was working early in the season was now hit and miss. “We moved it around and put more experience in certain areas. “Bringing Joe (Magunda) back in allowed us to move Jack (Edwards) back to play a deeper role and we’ve got more legs into the front four. “The bit of tinkering has paid off, more so in the two away performances than against Dunstable. “People forget that Richard Taundry has played 150 League games at right-back. A tide of optimism is now spreading through the club, with tomorrow’s opponents King’s Lynn just three points ahead of Brakes in the fifth and final play-off position. “I’ve been saying we just need to string some wins together and now we look in a decent position again,” added Holleran.